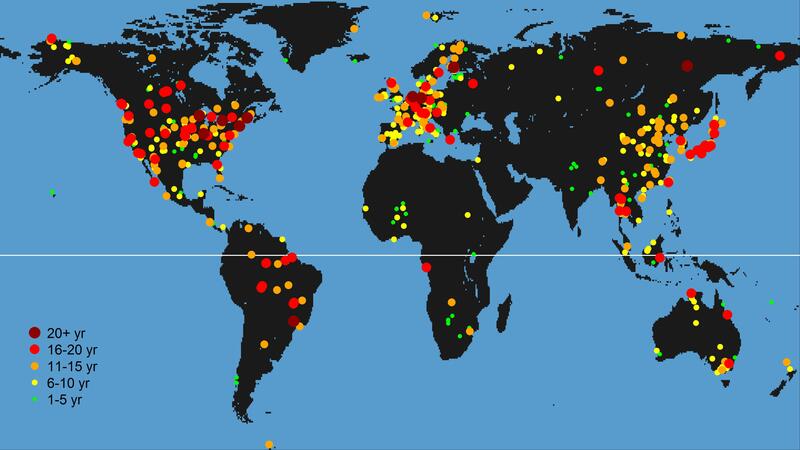 Welcome to the FLUXNET Young Scientist Network (YSN), a community of about 400 people consisting of students (~65%), postdocs (~26%) and other early career scientists (~9%) from more than 50 countries (Figure 1). This network aims to connect young and early career scientists working within the FLUXNET community and the regional networks. ‘Young’ scientists in this network are defined on academic rather than biological age. The YSN includes students (from undergraduate to PhD), postdocs and other early career scientists, who do not lead their own research groups and who are not the main supervisor of PhD students. The FLUXNET YSN provides an informal exchange platform for questions regarding research, career and funding opportunities for young scientists. Furthermore, young scientists can present themselves and connect to colleagues through this network. Last but not least, the YSN aims to bridge the gap to experienced researchers by integrating young scientists actively into the international research community. The FLUXNET YSN consists of a mailing list and an interactive Web site (under construction). To participate in the network, please register at the Young Scientist Mailing List Subscription. After completing your registration, you will receive an email with further instructions. More information on the YSN can be found in the October 2009 (page 9) and April 2011 (pages 4–5) issues of FluxLetter, and the 2012 issue of iLEAPS Newsletter. Follow FLUXNET YSN on Twitter @FluxnetY for more real-time updates. To subscribe/unsubscribe to the FLUXNET YSN mailing list, please use this Subscription Page. To send an email to the FLUXNET YSN mailing list (e.g., post a job, workshop opportunity), please use young-scientist(at)george.lbl.gov.